In The Practical Enchanter you mentioned that alchemy isn’t cost effective (p 49). How so? How might you change it to make it cost effective? For those who aren’t reading that particular book, that’s the note under Alchemical Bonuses that – in general – spells that grant alchemical bonuses aren’t cost-effective simply because they’re far more complicated than spells that grant similar bonuses through other means. For a practical example, lets say you want to increase someone’s strength. Direct Transmutation magic – and the resulting Enhancement Bonus – is simplest; you simply amplify the force that their muscles produce and toughen up their body a bit to withstand the strain. That’s straightforward and works with their body’s natural tendencies. Ergo, an easy spell, and one that’s relatively easy to scale up. Thus the Enhance Attribute spell template. Spells that provide a Morale Bonus are actually pretty easy; all you’re doing there is mobilizing the bodies natural reserves – basically releasing adrenaline and overiding the safety limits of the parasympathetic system. The trouble with this is that there’s only so much there; once the reserves are all in use that’s all there is – and those reserves are not normally available because operating on that level for long will tear muscle fibers, destroy tendons and ligaments, damage joints, and break bones. Now, d20 human bodies heal far more easily, and are inhumanly tough to begin with, so they can withstand short bursts of this sort of thing without lasting damage – but this is why the Wrath series of spells only goes so far and the seventh level version (on page 37) is specifically listed as the upper limit for such spells. It’s no coincidence that it’s the same upper limit for barbarian rage. A spell that grants a Circumstance Bonus might wrap the recipient in a force-field exoskeleton that amplifies the force he or she exerts and handles most of the support and back-pressure from it. Unfortunately, that calls for a complex feedback control loop to avoid exerting excessive forces and penalizing the user’s sense of touch. It won’t work right if it winds up exerting too much force against the ground and sending the user flying with every step. The user wants to swing that sword harder – not crush it’s hilt in his or her fingers. That’s a lot more complicated, and so such a spell is (per page 13) about three levels higher than an equivalent Transmutation spell. Spells that grant Inherent Bonuses to Strength essentially rebuild the recipients body to make it stronger – the magical equivalent of genetic augmentation or cyberware in more “realistic” games. That’s a very complicated effect, and so such spells are of rather high levels. It’s also no coincidence that they cost “experience points” – a form of supernatural energy which accumulates in people until it reaches a critical threshold and discharges itself in permanently transforming and enhancing them – unless they drain some of it off into transforming normal items into magical ones, or use small amounts it to make major – but temporary – transformations in targets, or use that power in other ways first. There have been attempts to design spells that grant a Sacred (positive energy) Bonus to strength by feeding extra energy to the muscles and adding in a minor, ongoing, healing effect to handle the resulting damage to the recipients body. Unfortunately, a shortage of energy isn’t what limits muscular strength – so what this results in is an endurance-increasing effect coupled with a bit of fast healing. Those are both very useful effects, but neither actually adds to the recipient’s strength. Now lets say we want to provide an Alchemy Bonus to strength via a spell. Alchemy bonuses come from compounds and drugs – things which get the body to perform in an unnatural way or function on their own. Fortunately we aren’t limited to real compounds and drugs. A powerful stimulant spell is simple enough – usually around level three – but why bother with a spell? It’s going to work exactly the same way (and have the same disadvantages) as a big dose of any other powerful stimulant, such as cocaine or methamphetamine. If you don’t mind the side effects, you might as well just use chemicals instead of wasting a good spell on a relatively modest effect. In settings where drug prices are not artificially inflated by laws against them (not that adventurers commonly pay much attention to the local laws), an emergency dose of some stimulant is cheap enough. An alchemical antitoxin spell would either create a general (magical) antitoxin or analyze the poison involved and produce a specific antitoxin. The first is pretty complex; it may be a fairly minor effect, but it’s going to require either giving up some experience points or a very high level spell to produce a magical compound that will last for awhile. The second has a selection of advantages – you could take a poison sample and produce antitoxins which could be taken in advance, or be carried along to spare spell power for more important things – but it is (once again) a very complex effect, and thus a high level spell. It’s generally a lot easier to simply get a “Neutralize Poison” spell. To produce a substantial direct alchemical bonus to strength you’ll want to create some chemicals – most likely enzymes – that (1) rebuild the muscle fibers to increase the force with which they contract, (2) make the tendons and ligaments tougher, and (3) increase the structural strength of the skeletal system and joints. If you want a long-term boost, you’ll want to increase either metabolic efficiency or the ability of the blood to carry oxygen and nutrients and digestive efficiency. We’re looking at pretty high complexity, and thus high-level, spell there – and all for a not-all-that-large temporary boost to strength (if you want it permanent, you’ll need to modify the recipients genes and metabolism to keep on producing those compounds). That’s why spells which grant alchemical bonuses aren’t generally cost-efficient; most of them are of far higher level than equivalent spells using other types of bonuses. There really isn’t any good way around that. On the other hand, if you just want a spell that produces acid, or transmutes material, or some such effect, you can certainly call it “alchemical magic” and it will work just fine. It won’t be providing an “Alchemical Bonus” though. Probably intended more for use by NPCs than anything else. No it is not intended for NPC use. It is a very useful effect when put in a high level spell WITH a enhancement bonus past the point where enhancement bonuses have diminishing returns. Oh, it’s not particularly intended “for” anyone – except Derek. It’s just a “this is the way things work and why”. In practice, the odd, inefficient, bonuses tend to be used more by PC’s, since they’re usually the ones who are willing to invest that kind of effort in getting another point or two of bonus. Of course, Burning8Bones tends to make magical researchers who try to put together ultimate (or sometimes just ultimately reckless) spells. Interesting. There is one advantage that I can see that you missed- alchemy can be stored and spells can not, at least for a very long duration. It would be very difficult to use the muscle enhancer for an army of 500 as a relatively low level spell but as alchemical material, it just takes the time (and cash) to fill the vials before hand. Thanks for the answer! Alchemy has always been my second favorite fantasy “science” (after biotech) and you gave me some very useful ideas in this article. The low-powered Ceremonial Magic system here might prove useful. The Exotic Compounds might be handy. They include Vidan (a drug which breaks down mental barriers), Kos and Narhan (a sensory amplifier and a regeneration-inducer), M’ram (a stimulant), Denila (metabolic stabilizer), and Zashin (A drug that extends the user’s mind into other dimensions). The Alchemical Magic spell list was in Eclipse, but got a few extra notes. The Alchemic Mastery option in this set of power-packages is good for making adventurous alchemists. Zareth has a listing of his usual alchemical wares. That’s most of what’s up about alchemy for the moment. I may rummage out some material though. 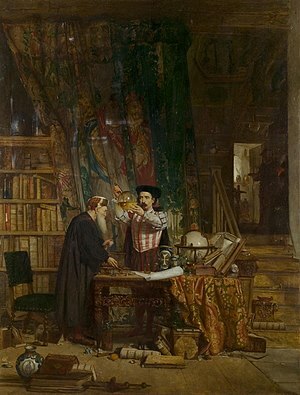 Interestingly, alchemy is an early form of science. The successful elements eventually formed a basis for chemistry, and many early “scientists” were little more than alchemical tinkerers, such as Francis Bacon, They were often more concerned with power and wealth than any modern notions of a love of knowledge. As for Burning8Bones’s suggestion, it’s always a matter of what you use your spells for. You can work on getting every little edge you can, but it starts adding up to a huge fortune after you’ve grabbed the low-hanging fruit. Then you have to live with the side effects of any long-term enhancement, and you have to consider what your alternatives are. So you can get massive but brief bonuses fro using, as he suggests, a variable spell. But that spell will have a lot of functions, be harder to research, and still be situational. That doesn’t mean it’s useless, just tricky. I think he was considering a combined spell that provided a package of differing bonuses at the same time. Of course, that’s probably even more complicated than one that can provide a variety of bonus types.